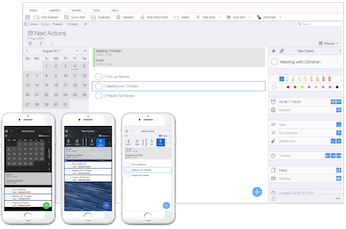 macOS Calendar: Display your macOS Calendar entries in the MyDay Panel (displayed as list for the week) or side by side with your tasks in the "Next Actions" view. Notifications: Set the "Review Date" and time for your tasks to get a reminder and show them as Notification Center. Menubar Item: Use the macOS menubar item for quick access to add a new task - no matter what you are doing on your Mac. 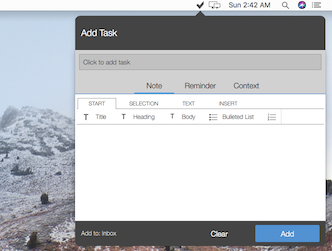 Services Menu: Mark text in any app and convert it into a new task using the Services menu. 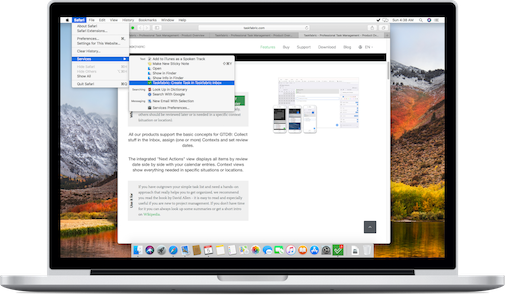 File Drop: Create new tasks by dropping a file from the macOS Finder to any project. 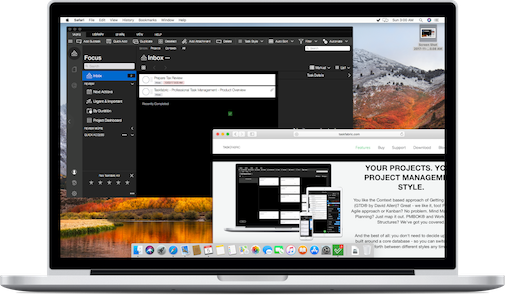 Apple Mail Drop: Create new tasks by dropping an email from Apple Mail to any project. Browser URL Drop: Create new tasks by dropping a web link from Safari or most other web browsers to any project. 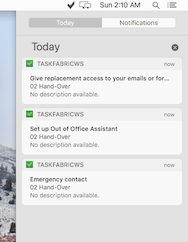 Import macOS Reminders: If you want to switch from macOS Reminders to our products, you can import your existing lists and tasks automatically. Use the "Next Actions" view to display upcoming tasks for review. With calendar integration enabled all Calendar entries from macOS Calendar are displayed as well. For a direct view at upcoming events from your macOS Calendar display the Calendar bar on the MyDay Panel. Set the "Review Date" and time for your tasks to get a reminder and show the task in the macOS Notification Center. Tapping the notification brings up the app to get a quick overview of all tasks for the day. 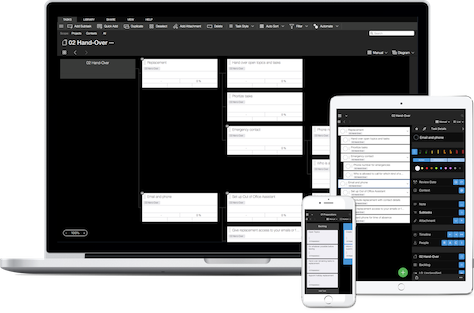 Need a quick way to get your thoughts added as tasks while working on something else? With direct access from the right side of your menu bar you are always just one click away. Want to convert your current selection into a new task? 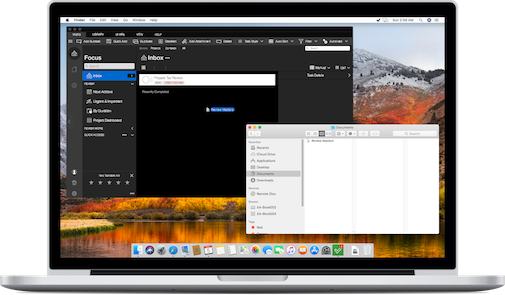 Using the Services menu you can do this with any text selection - directly from Apple Mail, Safari, Word, Pages and many other applications. 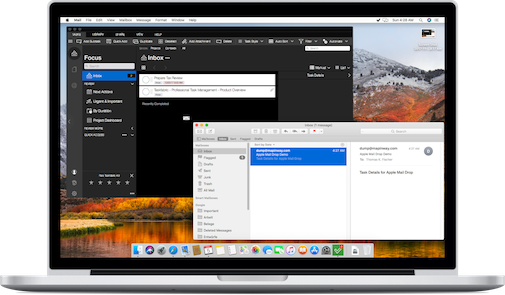 Create tasks from any email in Apple Mail by dragging it to any Project. This makes it easy to follow up on stuff you receive by email. The title of your email is automatically added as tasks title and the original message is linked as attachment. Naturally you can assign review dates, priorities, context or track progress. Create tasks from your web browser by dragging the link from the address bar to any Project. This makes it easy to follow up on stuff you see in your browser or to create a project sensitive bookmark collection. Customize the App Icon Badge to display the number of tasks for review today, overdue tasks or the number of entries in your inbox. From the "Share" tab on the Ribbon Bar select "Import" to import macOS Reminders lists and tasks. They are imported as Projects and Tasks to make migration easy.